For UK LGBTQAI+ organisational endorsements, please sign here by February 22nd. For LGBTQAI+ individuals endorsements, please sign here by February 22nd. We, as Palestinians, have not been allowed to return to our homes for the last 70 years. We live under a brutal military occupation in the West Bank, under the blockade in Gaza and as second-class citizens in Israel – we endure Israel’s discriminatory and racist policies every single day of our lives. We know too well how Israel tries to pinkwash these abuses by showing itself as a progressive country on LGBTQAI+ rights. Yet the reality is that the Israeli army kills Palestinians no matter if they are queer or not, bombs houses in Gaza independently of how Palestinians living there identify sexually, and unlawfully arrests Palestinians regardless of their sexual preferences. 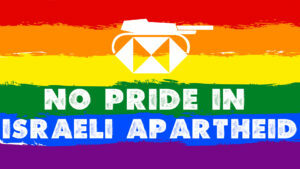 It is not only Israel which deploys pinkwashing strategies to cover its crimes. Nowadays, many corporations use homonationalist discourses of supporting LGBTQAI+ rights to mask their human rights violations. For example British bank HSBC,one of the world’s largest banks, – invests in companies that arm Israel. These include Caterpillar – one of the main companies providing the Israeli military with bulldozers used to demolish houses or whole villages as forms of collective punishment or to build illegal Jewish-only settlements. These constitute war crimes according to international law. Though HSBC recently announced it was divesting from Israeli arms manufacturer Elbit Systems due to “human rights” concerns – a significant positive step which followed a year-long campaign by activists – it is clear that HSBC must now act on the rest of its complicity by cutting links with all companies implicated in the violent oppression of the Palestinian people. We are aware that HSBC uses different marketing strategies to launder its image. In fact HSBC has become the main sponsor of Birmingham Pride in an attempt to “pinkwash” its complicity with human rights abuses. From queers to queers, we want to call on all UK groups and specifically groups in Birmingham not to accept HSBC’s sponsorship, in the name of transnational solidarity. We, Palestinians, want to send companies and states who pinkwash their crimes a clear message: oppressed groups know too well that no one will be free unless we are all free, and no group’s rights should be used to cover the violation of any other group’s rights. Stand on the right side of history and do not accept sponsorship from HSBC until they divest from all companies arming Israeli Apartheid.